Although my private practice is almost entirely made up of psychotherapy and counseling clients (and supervision of newer therapists), I sometimes mentor people considering going into social work or other mental health professions. I thought I would provide some of the most frequently asked questions about social work here, in honor of social work month. A. A social worker is a type of therapist (or psychotherapist if we want to differentiate from speech therapists, massage therapists, etc.) Social workers can do other things beside therapy. 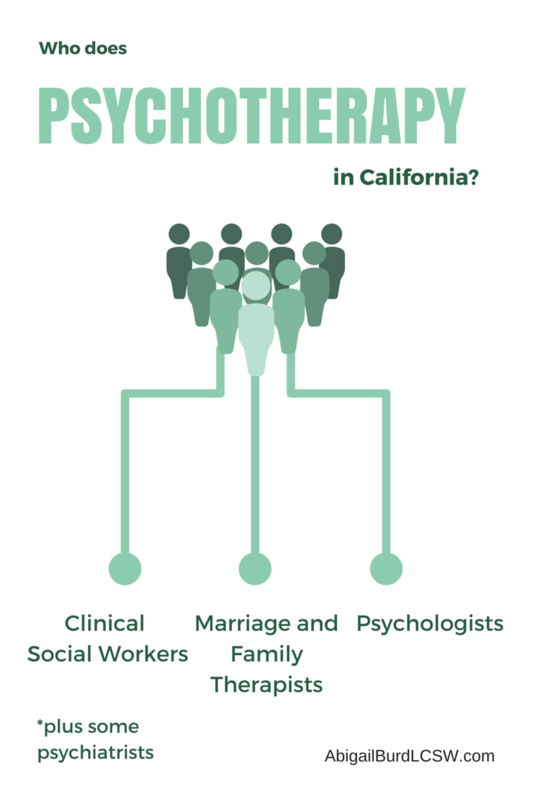 Social workers that do therapy are frequently called “Clinical Social Workers” and in the state of California, the Board of Behavioral Science licenses us as “Licensed Clinical Social Workers,” which is abbreviated as LCSW. Psychiatrists are medical doctors that have a board certification in psychiatry. They are able to prescribe medication. Some of them do provide therapy, and more of them would like to, but managed care usually will only reimburse them for medication management. A. A psychologist is someone who has a doctorate of psychology or PhD in psychology and is licensed by the Board of Psychology. Many are therapists, although some are researchers or organizational psychologists. Psychologists can also provide psychological testing. Marriage and family therapists (MFTs) almost exclusively provide therapy, and have a special interest in couples and families. Clinical social workers provide therapy, too, and like MFTs are licensed by the Board of Behavioral Science (BBS) in California. In addition, the BBS recently recognized Licensed Professional Clinical Counselors. A. For the most part, we have more in common than we have that is different! We are all interested in supporting people as they make meaningful change in their lives. There are more differences within the groups than between them, that is when picking a good therapist, it may come down to more individual characteristics. Some general differences, though, are that psychologists look at a person’s mental and behavioral health. A marriage and family therapist looks at mental and behavioral health within the family system. A social worker looks at biological, psychological and social aspects of the person, in the context of their environment. Apart from the “person in the environment” or ecological perspective, social workers are the only group of therapists that are charged with social justice. Q. “What is ‘social justice'”? A. Social justice is the view that everyone deserves equal economic, political and social rights and opportunities. Social workers aim to open the doors of access and opportunity for everyone, particularly those in greatest need. A. One of the reasons I settled on social work as opposed to marriage and family therapy, is that social workers can do many different kinds of jobs. I figured if I ever got bored, I would be able to switch pretty easily. Social workers help families with adoptions, protect children in child welfare/child protective services, help seniors and older adults, provide medical social work in hospitals and clinics, perform psychiatric social work in mental health settings, provide community organizing and lead organizations. And that’s just the beginning. 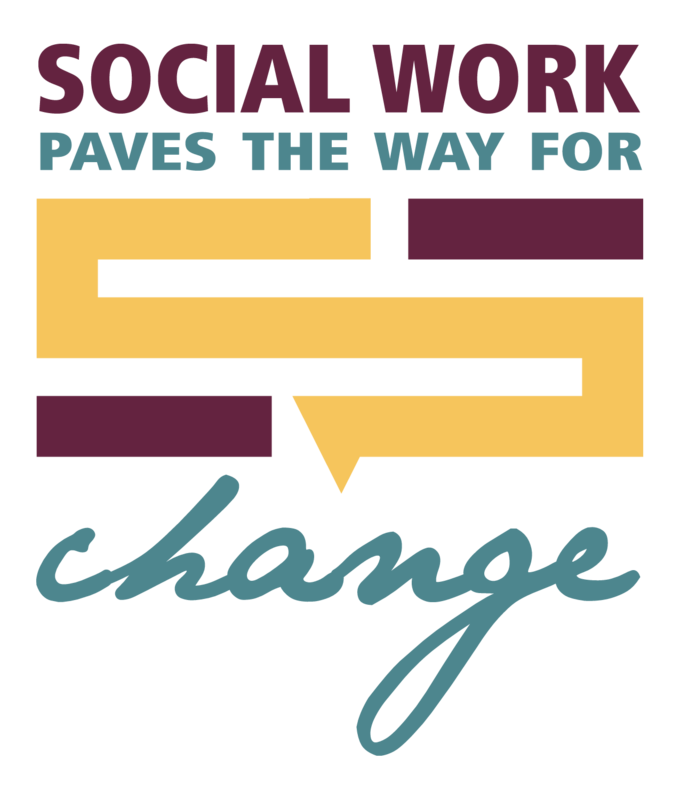 One of the benefits of social work is the ability to see what is needed from a systems perspective and work towards meaningful change. A. A Bachelors of Social Work from an accredited university (BSW) is often a requirement for entry level jobs, such as discharge planning in a hospital, or positions within child welfare. Most jobs require the completion of a Masters of Social Work. Clinical positions often require a license, or that a social worker be in the process of working towards a license. To be licensed in California, a social worker must work 3,200 hours post Masters under supervision performing relevant services. After their hours are approved, they must also pass two licensing exams. Once licensed, LCSW’s are required to stay current by completing continuing education (32 hours every 2 years.) For more on the path, see this page. Want to read more about clinical social work? Please see my interview last year with Gill Andrews. Good questions and great, helpful answers! Thanks for all the clarifications and happy social work day! You do such great work! Hats off to all the social workers out there. Thanks for all you do. I used to think of social workers as police, mostly because of how they are positioned in movies, usually involving having to take kids away from families (most times for good reason). I understand know that they are so much more than that after reading this post and during our recent hospital stay. We had a social worker come in and help us gather information for my husbands work, they informed us of all our options and made it known that they were there to help us and make things as comfortable as possible for us, within their reach of course. Thanks for sharing the differences between these amazing professions, Abby.